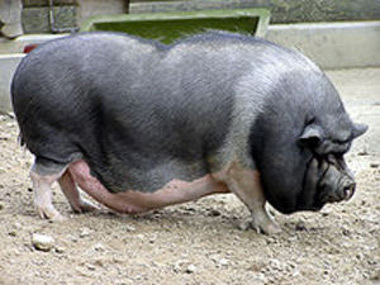 Vietnamese Potbelly Pigs are considerably smaller than standard American or European farm pigs, they weigh 43 to 136 kg (100 to 300 lb). Boars become fertile at six months of age, long before they are completely physically mature. Pot-bellied pigs are considered fully grown by six years of age, when the epiphyseal plates in the long bones of the legs finally close. Today, the Vietnamese and German governments have realized that the indigenous Vietnamese pig subspecies exist only in mountainous Vietnam and Thailand. The Vietnamese government has begun to subsidize local farmers who continue to raise the indigenous pot-bellied pigs because it realizes they are neither as prolific nor as large as other breeds.